Sunday, February 23 1908 -- The arrival of the Chicago White Sox crew is expected in just nine days, and Hen Berry's Angels are ready to meet them with open arms and great fanfare. But that doesn't mean they don't plan to play hard when the exhibition games begin! Calvin A. Fader was born in Massachusetts on September 18, 1905, according to the Social Security Death Index and the censuses. In the 1910 U.S. Federal Census he was the second of three children born to Alexander and Carrie. They lived in Somerville, Massachusetts at 19 Ash Avenue. His father was a window decorator in the millinery industry. The date of Fader's move to Washington, D.C. is not known. In 1920 the Faders lived in Washington, D.C. at 1434 Perry Place. The United States Forest Service publication, Forest Service Bulletin, Volume 13, 1929, reported on a new strip. 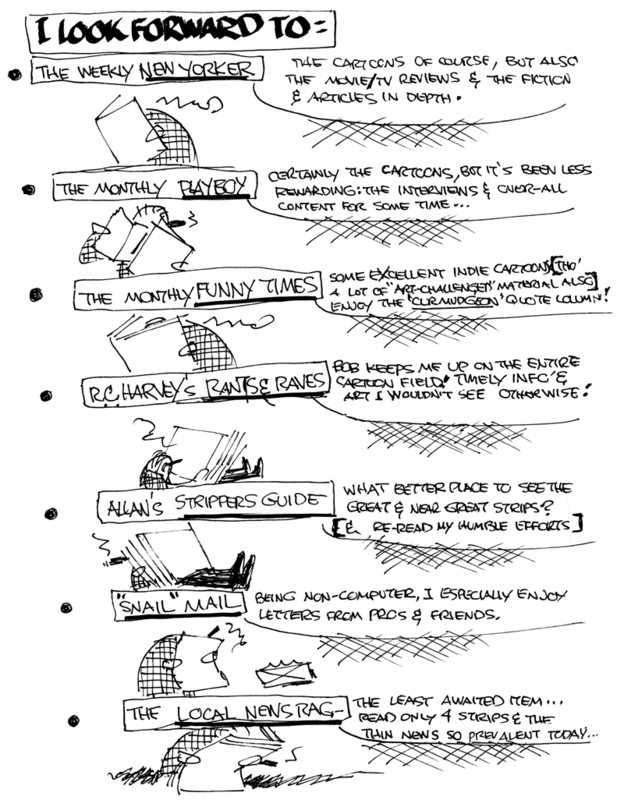 This is the title of an educational features "Strip" sponsored by the National Lumber Manufacturers Association. The sketches will be drawn by Calvin A. Fader who is now featuring "American History by Motor." The sketches will appear in the newspapers for a period of one year beginning next September. Fifty-two "commercial" trees have been selected to be featured—one tree each week for one year. Each strip will contain five panels in which will be told how each tree serves mankind. For example: In the hickory tree strip Panel No. 1 will hold a drawing of the tree in the upper half; in the lower half a map of the United States, a shaded area showing where hickory trees are to be found. Panel No. 2, drawings of hickory leaves, buds, nuts, blossoms, and bark. A study of these pictures will enable one to identify a hickory tree in the forest. Panel 3 will feature some of the principle products of hickory wood—golf clubs, axe handles, wheel spokes, etc. In Panel No. 4 pictures and text will tell the annual cut of hickory; its value, etc. In Panel No. 5 will be pictured something that will forcibly center the mind of the reader on the subject. Ten years later most of the Fader family remained at the same address. His occupation was newspaper artist. One of the strips he worked on, in the early 1930s, was George Washington's Travels. The Springfield Daily Republican (Massachusetts) reported his upcoming wedding on June 21, 1935. Among tomorrow's weddings will be that of Miss Dorothy Elizabeth McCray, daughter of Mr. and Mrs. Walter F. McCray of 223 White street, and Calvin A. Fader, son of Mr. and Mrs. Alexander G. Fader of Washington, D.C. The ceremony will take place at 11 at the McCray home and will be followed by a wedding breakfast.…. ...Following a stay at Groton Long Point, Ct., the couple will make their home at Washington, D.C., where they will receive friends after July 15. The bride-elect is a graduate of Classical high school and Mount Holyoke college. She has been a teacher at Norwich Free academy at Norwich, Ct. The groom is a graduate of the Meyer Beth College of Commercial Art at Chicago, and is a commercial artist…. The Editor: The Journal of Information for Literary Workers, 1936, published a listing for Parade of Youth, based at 1727 K Street, NW, in Washington, D.C., "Parade of Youth is a weekly newspaper for boys and girls appearing in daily and Sunday papers all over the country." Fader contributed illustrations for many of the serialized stories, such as, "A Man's Job" (December 5 and 12, 1937), and the panel, Now I Know. 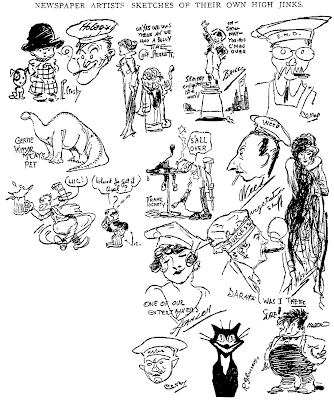 The Springfield Union and Republican (Massachusetts) published his Sunday strip, Doggy Dramas, beginning on March 20, 1938, on "The Boys and Girls Page". …They have one daughter, Mrs. Calvin A. Fader of Silver Springs, Md., and one grandson. Their son-in-law was formerly a commercial artist for The Union. Their grandson, a recent graduate of the University of Maryland, is doing research work for the government in Italy. Fader passed away in September 1978 in Silver Spring, Maryland, according to the Social Security Death Index. Ed Wheelan's Minute Movies, with its unusual approach of telling short stories using a regular cast of 'actors' who acted in 'films', running in two tiers of small panels, was a hit in the 20s but old hat by the 1930s. In fact the feature was cancelled and pretty well forgotten before the end of the decade. That seemingly obvious hint that the approach was out of favor with readers didn't slow down Calvin Fader. He must have been a fan of the series, because he stole all those elements from the defunct Minute Movies in 1938 to create Doggy Dramas Present. His nod to originality was that all his 'actors' were dogs. The dog angle gave Fader the excuse to make lots of really awful puns (we're talking 'pooched eggs and pupperoni' level). With so many awful puns to wade through, it was perhaps a blessing that the strip ran only once a week. It was syndicated by Associated Editors as an element of their weekly children's activity page, and replaced the long-running Adventures of Peter Pen, the previous weekly strip, on March 20 1938. Stories usually ran for six to ten episodes, with occasional one-shots in between, and covered the gamut of Saturday matinee movie genres -- comedies, adventures, mysteries, westerns, short subjects and so on. Fader apparently wasn't all that proud of his work on the feature, because I don't believe he ever once signed the strip. He did get a byline starting in 1940, and was credited in Editor & Publisher, but never a signature. And that's a slight problem because I have a note in my research database saying that Al Fagaly did the strip in 1938-39. Unfortunately I failed to make note of the source of that information. Looking at the art from 1938 and 1940, though, I see no difference and think the Fagaly citation is a red herring. 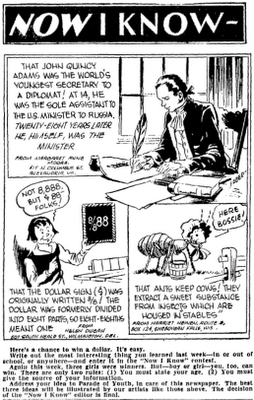 Associated Editors dropped the strip from their children's page on March 14 1943. If Winsor McCay, the prominent vaudeville acrobat, hadn't announced at the newspaper illustrators' dinner yesterday morning that he was about to Introduce his latest freak, the dinosaurus, and if Arthur Hammerstein, the Broadway Adonis, hadn't walked in just at that moment, surrounded by perfume and ten little "High Jinks" girls, one illustrators' party would have gone down in history as having been held without police interference. As it was, the sound of the applause reach the ears of the ever alert town constables, Luke Geeghan and Henry Rausch, who keep the peace o' nights in Columbus Circle, and they just had to lope over to Reisenweber's to find out what it was all about. They were immediately placated, however, for Clive Weed, who is well known to the police, and Clare Briggs, who is rapidly becoming acquainted in the effete East, were determined that nothing should prevent the dinner from being what Mr. Hammerstein calls a "Chief Doover," and nothing did. The two officers got what they came for and departed some time after, chanting a song that Briggs picked up in the Latin Quarter of Chicago. Outside of a few minor details like the above and the fact that there was little white space in the dining room, the dinner was a huge success. Everything that could be done was done. Beefsteak was strewn about the floor in neat mosaics; Mrs. "Bud" Fisher threw herself into the spirit of things and taught Arthur Hammerstein the "Artists' Amble"; "Hal" Coffman wrote his autograph on everybody's hat; little Miss Barnett defied her manager and said that she would dance with.any fellow she liked after working hours, and the waiters were well dressed. When everybody had met everybody else, and when the "High Jinks" ladies had become used to the artistic atmosphere, some one—it couldn't have been a press agent—began showing moving pictures of Winsor McCay's latest creation. He, being a shy fellow, only prefaced the views with a speech of about an hour's length, but the pictures were good, even with that handicap. Even a moving picture critic from "The Mount Vernon Bee" admitted this fact. He said this, says he, not because he was a friend of Mr. Hammerstein, who is going to put them on in vaudeville, but because he couldn't witness an artistic piece of work and withhold due praise. After the artistic pictures there were some regular moving pictures, but nobody looked at them at all. Someone attacked the piano and some one else cleared the beefsteak from the floor, so that those who were awake could dance. 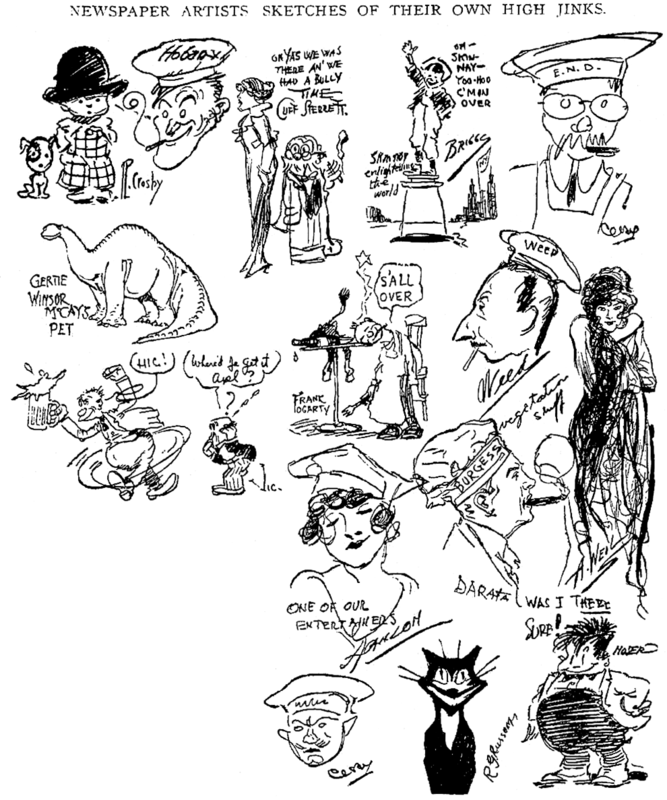 Contributors to Illustration: (top left to bottom right): Percy Crosby, Walter Hoban, Cliff Sterrett, Clare Briggs, Oscar Cesare, Winsor McCay, Frank Fogarty, Clive Weed, Vic Forsythe, Lou Hanlon, Darata?, A. Weil, Cesare again, Reginald G. Russom, Frank Moser. Thanks to Alex Jay for discovering this article! you ever get the feeling you were born too late to have gone to all the really good parties? I'm surprised George McManus isn't represented, seeing as he's in the film and everything. Was the framing sequence (inspired by this event?) filmed later? "Ralph Kemp was born on a farm near Lewis Creek and did much of his drawing on a farm near Morristown, Indiana…." according to the book, Indiana's Laughmakers: The Story of over 400 Hoosiers: Actors, Cartoonists, Writers, and Others (1990). The U.S. Federal census records put his year of birth at 1903. In 1910 Kemp was the oldest of two sons born to Charles and Stella. They lived in Hanover, Indiana, where his father was a farmer. In 1920 the Kemps lived in Ripley, Indiana, near other farmers. Indiana's Laughmakers said, "Kemp was a graduate of Morristown High School and attended the University of Detroit." His marriage to Crystal Hollingsworth, on May 28, 1925, was recorded in the Indiana Marriage Collection at Ancestry.com. The couple lived in Gadsden, Alabama at 118 Stillman Avenue, according to the 1930 census. Indiana's Laughmakers said, "He tried many things but believed his great love of drawing prevented his success at other careers. Over time, drawing changed from hobby to a business. Prior to that he worked for the publicity division of the Indiana state welfare department, doing art work and photography. Over a period of eight years, he developed his characterization of Tode Tuttle." While in Mazatlan, Mexico with his wife, Kemp suffered a heart attack and passed away on February 12, 1964, according to the Department of State Foreign Service of the United States of America record, Report of the Death of an American Citizen, at Ancestry.com. The document revealed he was retired and lived in Franklin, Indiana at 1001 East Jefferson. The Indianapolis News, (Indiana) published an obituary on February 20, 1964. 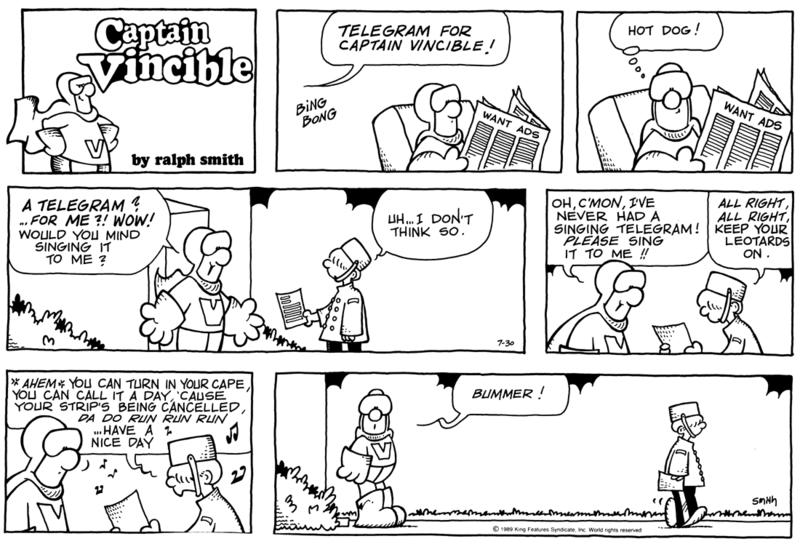 We discussed Captain Vincible as an Obscurity of the Day last week; Mark Johnson very kindly sends us the complete final week of the strip. Funny, poignant stuff. Thanks Mark! The last week of Downstown was pretty poignant, too, if I remember correctly. 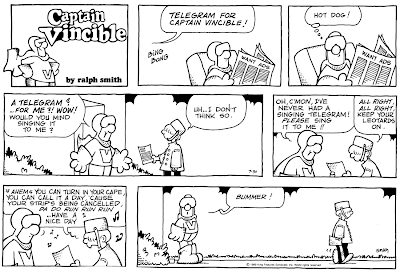 Good strip, not as well remembered as it should be.